This highly effective product from Misco can be used as a sanitizer, disinfectant and deodorant in a number of locations depending on the need. 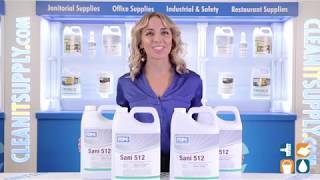 Sani 512 can be diluted with water and used as a sanitizer for countertops, eating utensils and drink ware. No rinsing is required. Just spray and go! If it is a disinfectant you need, this extraordinary product can be used to disinfect walls, metal and painted surfaces, showers, athletic equipment, garbage cans, lavatory fixtures and many other hard, nonporous surfaces. Its versatility and effectiveness against salmonella, choleraesuis, staph and pseudomonas makes Sani 512 an ideal sanitizer, disinfectant and deodorizer for use in meatrooms, dairies, poultry plants, bars, restaurants, cafeterias, gyms and more. 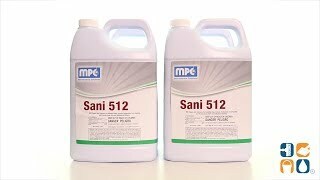 If you are concerned with keeping your facility clean and germ-free, Sani 512 from Misco Products is for you. Stock up today and save!